Thomas Chandler Haliburton | Launceston Then! Thomas became a noted local business man and a judge, but his greatest fame came from his writing. He wrote a diverse number of books on history, politics and farm improvements. He rose to world-wide fame with his ‘Clockmaker’ serial that first appeared in the ‘Novascotian’, and was later published in book form throughout the British Empire. 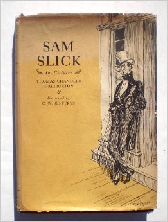 The books recounted the humorous adventures of the character ‘Sam Slick’, and became extremely popular light reading. From 1826 to 1829 he represented Annapolis County in the Nova Scotia House of Assembly. Thomas Haliburton retired from law and moved to England in 1856; in that same year he married Sarah Harriet Owen Williams. In 1859, he was elected Member of Parliament for Launceston, as a member of the Tory minority. He did not stand for re-election in 1865. While representing Launceston, he would stay at the White Hart Hotel, in the Square. On one of his many visits he was given the honour of laying the foundation stone of the new Grammar School in St Thomas New Road. The Foundation Stone of the Launceston Grammar School was laid by Mr Haliburton, M.P. for the borough, on Tuesday last. About half past 12 o’clock, the pupils attached to the Grammar School, who have for some time been under the instruction of Sgt Gould, proceeded through some of the principal streets of the town, and the bells struck out a merry peal. The boys were attired in uniform expressly adopted to their situation, of an exceedingly light and neat appearance. A few minutes before One, the Mayor and Corporation, accompanied by Mr Haliburton, M.P. and other gentlemen, emerged from the Council Chamber, and proceeded to the spot where the ceremony was to take place. A form of prayer was read by the Reverend SC Clarke, and a portion of the 127th Psalm, after which Mr Haliburton laid the first stone with these words:- “In the faith of Our Lord Jesus Christ, and in the name of the Father, and of the Son, and of the Holy Ghost, we lay this foundation stone.” The boys were afterwards put through a variety of evolutions by Sgt Gould. Mr Haliburton died on 27 August, 1865, after a short illness. 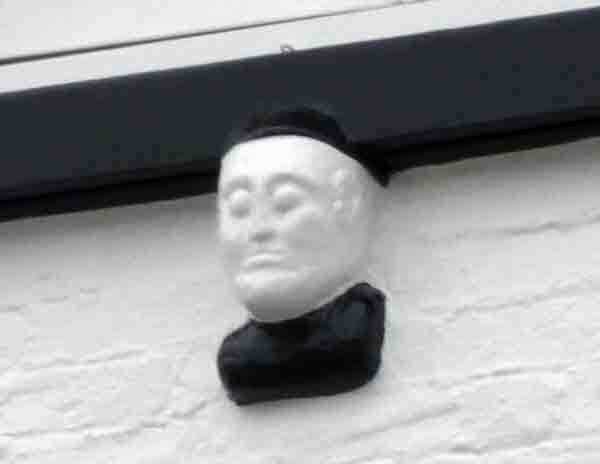 One of the honours from Launceston was a bust of himself, which was inserted into the fabric of the front of the White Hart Hotel, just below the window of the room it is thought he stayed in on his visits to the Borough. Letter To The Editor: A Launceston Hotel. From – Mr GS Brendon, 12 Northgate Street, Launceston. Dear Sir, in “M.B’s” letter in a recent issue with regard to the bust of ‘Sam Slick’ the nom de guerre of TC Haliburton, I have heard from an old gentleman the account of the ‘bust’ and his staying at the White Hart Hotel, and it seems to be quite correct that he had stayed at the hotel. The bust has evidently been built into the fabric of the hotel since it was first built. T.C. Haliburton was returned as MP for Launceston at the general election of 1859, he being the protégé of the Duke of Northumberland of that date. Haliburton was descended from an old Scottish family, was born at Windsor, in Nova Scotia, in 1796, the son of a judge of that colony. He was educated at King’s College in the same colony. He became a barrister and a Member of the House of Assembly. In 1829 he was made a judge of the colonial Common Pleas, eleven years later a judge of the Supreme Court; retiring from the Bench in 1850, and came to England. He laid the foundation stone of the Grammar School in 1861. He withdrew from public life after the dissolution of July 1865, and died the following month.